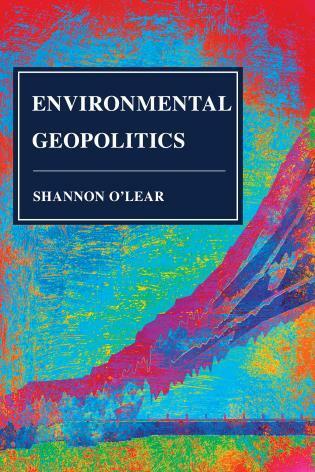 Shannon O'Lear, a KU professor with a joint appointment in geography & atmospheric science and the Environmental Studies Program as well as current director of the Center for Global & International Studies, is the author of "Environmental Geopolitics" (Rowman & Littlefield, 2018). O'Lear defines environmental geopolitics as "examining how environmental themes are used to support geopolitical arguments and realities." Her new book "looks at narratives about resources, overpopulation and climate security — and takes those ideas apart to ask, 'Do those thoughts really make sense, and what assumptions do we make when we talk about something like climate security?' The book demonstrates how we can be more inquisitive about how we understand our relationship with the environment." "Environmental Geopolitics" centers around case studies and ideas that challenge long-standing notions about overpopulation, resource conflict, climate security and the communication of scientific ideas and imagery. As a starting point, O'Lear calls for critically questioning exactly what stakeholders mean when they discuss the very term "environment." "We've effectively created an artificial habitat for ourselves with things like irrigated agriculture and air conditioning and all the impacts of those," she said. "So, when we're talking about sustaining the 'environment,' it's often not clear what we're sustaining or where the environment ends and where people begin. Who gets to tell the story of what the environment is and what our relationship to it is?" O'Lear urges a close examination of conventional ideas. For example, she trains a critical lens on concepts of resource conflict that often suppose a scarcity of resources like water, food, energy and commodities — some of which aren't actually scarce. "We seem obsessed with the idea that resources are connected to conflict," she said. "We can look at the example of diamonds and conflict in Sierra Leone. It's true you have rebel groups in Sierra Leone trying to control diamond mines because that's a way for them to buy weapons and fund their rebellion. Diamonds are related to that process. But you have to look back at the history of colonial times there and the elevation of a diamond economy over all others. Diamonds are actually very plentiful — but we've bought into the idea that they're rare and unique and special. Really, they'd be best used for drill bits. There are a lot of processes that contribute to violent conflict, but we're often missing important pieces." O'Lear said one idea obscured by orthodox discussions about the environment is "slow violence," or structural harm to people caused by gradual environmental problems that are hard to pin on one cause. "We're talking about structural violence and ways that systems of society are violent when people are marginalized or left out — not a direct 'I'm going to hurt you' kind of violence, but keeping people from health or benefits they could have, and harming them over time. These are creeping environmental problems like plastics in our bodies, and over time we're suffering from consequences. There's nobody specific to blame by the time the harm is evident. Nobody is going to be taking responsibility — the harm is indirect and latent. Another example would be the buildup of seismic activity where wastewater from fracking has been pumped back into the ground. Slow violence is tricky because it isn't so visible. Sometimes you have to interview people over long periods to see how things have declined over time." "We think science is going to give us the answers, but it can't," O'Lear said. "We need to be figuring out what our questions are. It's one thing to say, 'We'll do more science,' but we also need to think about how we operate as a society. We could be having conversations about what we value in our social and political environments. Then, we can find the science that gets us there." O'Lear questions some atmospheric carbon and temperature-rise targets, such as the 2 degrees Celsius global temperature-rise mark offered by the Intergovernmental Panel on Climate Change. Instead, she advocates more creative approaches. "It's like setting a speed limit, but then we become fixated with that number and how many tons of carbon we can emit," O'Lear said. "It becomes this carbon fetish. But no atmospheric scientist would give you that number without talking about ranges and conditions. We have taken science and dumbed it down for policymakers, so we sit around and talk about that number — but not about how we got to it or what contributed to it. The IPCC collects a lot of great science, but it doesn't tell us what to do — that takes society and politicians. We've been trained to be good consumers, but we need to be good citizens who take ownership of these issues." O'Lear wrote "Environmental Geopolitics" with her own students in mind, and she is using the book to teach a class this semester. However, O'Lear is mindful of meager student budgets. "We're using the book in my class," she said. "But I bought 50 copies of my own book and am loaning it out to my students. My effort here was about living the idea of buying less stuff. I plan to reuse these books with future classes of students until the books are too worn out or walk off on their own."